Since the addition of the Clan Warfare achievement in Counter-Strike: Source many people are wondering how to get it and how to set it up. It is, thankfully, quite simple and I'm here to show you how to set your character with a clan tag. First of all, you have to be a member of a Steam Group. There are many public groups out there that you can join; most servers will have their own set up for their web of game servers. If you're not a member of a group already, join up! If you already are, then you are ready for the in-game setup. Click on Community in the top menu, then Groups in the sub menu. 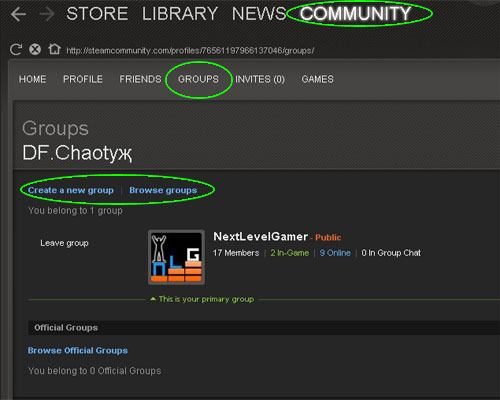 Make sure you are a member of atleast one group, if not Create or Browse groups. Next boot up Counter Strike. 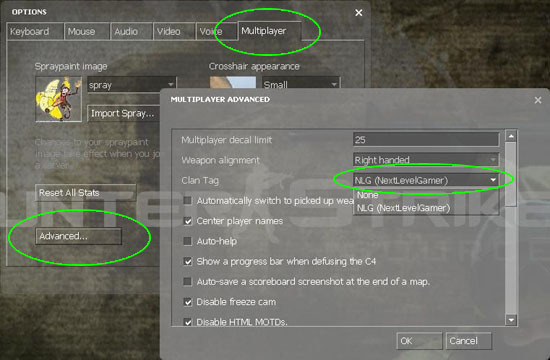 Once in open up your Options menu and click on the Multiplayer tab. At the bottom left click on Advanced... and behold the Clan Tag drop down bar. From here you can set your clan tag to any group you are a member of. The tag will be the Abbreviation Setting that is required when creating a group, in this case, NLG. Hit all the OKs and you're ready to go. And the Clan Warfare Achievement? Now it's quite simple isn't it? If you're not a competitive gamer then just get four of your buddies to be in the same group and set their clan tags up to be the same. Then find five other people in a clan to play against and win! Likewise, you can just get another five friends to join another group and take turns winning so everyone gets credit, but earning is just that much better is it not? Your Clan Tag (and other player clan tags) will now appear when you hit tab in game. If you're really not sure what group is right for you, feel free to join us in the NextLevelGamer Group, and/or throw us a shout in the forums if you need any help. Happy Hunting.